Toward the end of the Great War, Canadians were struck by the most devastating influenza epidemic in the young country’s history. More than 50,000 Canadians succumbed to this virulent strain of influenza that swept the globe in 1918 and 1919. Nearly as many Canadians died from this disease as those who were killed in combat overseas during the First World War. While the influenza epidemic of 1918 and 1919 has received recent scholarly attention outside of Canada, Canadian historians have only begun to examine the social consequences of this devastating event. The social history of disease and environmental history intersect because both sub-disciplines take into consideration the role of non-human actors in the past. The influenza virus that spread throughout Canada in 1918 and 1919 placed biological and material limits on human agency during this critical period in Canadian history. While the course of the epidemic was shaped by social and political factors, the disease itself ultimately came to have a significant social impact on Canadians. 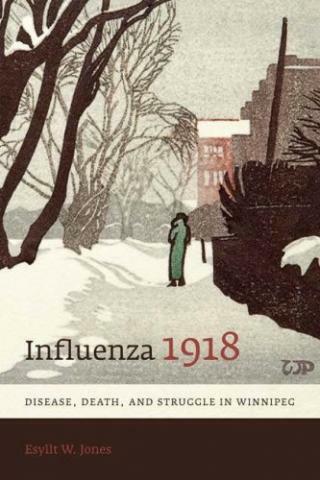 To learn more about the impact of this epidemic in Canada, we speak with Esyllt Jones about her book Influenza 1918: Disease, Death, and Struggle in Winnipeg. Jones, Esyllt W. Influenza 1918: Disease, Death, and Struggle in Winnipeg. Toronto: University of Toronto Press, 2007. Kheraj, Sean. “Episode 20: The 1918-1919 Influenza Epidemic in Winnipeg” Nature’s Past. 27 February 2011.